Around a year and a half ago I wrote a post about how my son has been learning Spanish using the free app Duolingo. Recently one of my colleagues Andrea, also a member of ASB's R&D Core Team, designed an iPad app to help students learn and improve their French. I wanted to share this because I think that so many "educational" apps are designed by people who are not actually teachers, whereas Andrea has taken ideas from her many years of teaching French and Spanish and her knowledge of students to design something that would be fun for them to play - and to learn French through this play. Her app is called A.C.D: The French Files. 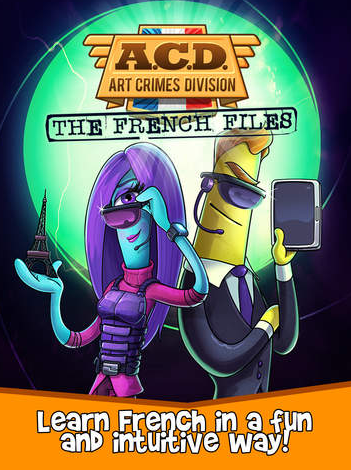 This game is about the Art Crimes Division (A.C.D.) who are on an adventure to uncover who has stolen a famous painting from a gallery in Paris. It's a special agent adventure game where students have to learn new vocabulary and build simple phrases for using with suspects. The idea behind the app is that students use French in everyday situations. For many years a dangerous group of people who call themselves H.A.R.M. have been attacking famous works of art from around the world. The Art Crime Division has been created to bring these criminals to justice. The best agents from around the world are trained to stop these evil characters. H.A.R.M. is preparing to strike again and the A.C.D. needs a new agent to take care of this threat. While playing this game, students become language learning agents who need to explore various scenes filled with conversations to be understood, objects to be found and a person to be caught. Personally I find it wonderful that a language teacher has decided to design an educational game to help her students learn French. I hope other teachers find this useful and inspiring. Andrea has many new ideas that she would like to add into the game in future. She is now looking for ratings on the game so that she can look for funding. She hopes that this will allow her to take the game forward by adding additional levels and to make the game in several different languages. Visit Andrea's website to find out more about A.C.D.